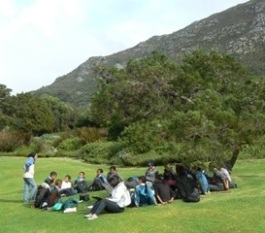 The programme caters for learners from Grades R – 12 and offers curriculum-linked lessons in the Kirstenbosch National Botanical Garden on a wide range of environmental themes including Biodiversity, Ecology, Global Warming, Water and Education for Sustainability. We aim to raise awareness of the environmental issues facing our communities and develop skills which will enable learners to take responsibility for their own environment. Approximately 15 000 learners per year attend lessons, facilitated by our experienced team of environmental education officers. The lessons are fun, action-packed and hands-on and offer learners an opportunity to interact with nature in a very personal way as they are encouraged to discover the environment through careful observation, recording and interpretation of data. School teachers, accompanying their groups into the Garden, are exposed to practical activities which can be used in their own school gardens or neighbouring natural areas. Lessons are offered to learners with a range of special educational needs. Each lesson is adapted to meets the needs of each specific group. Special lessons are facilitated in celebration of the Environmental Days/Weeks. 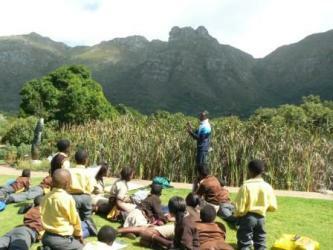 The sponsored Kirstenbosch bus enables school groups, which experience financial difficulties, to travel to and from the Garden free of charge. A school may use the bus up to 3 times per year. 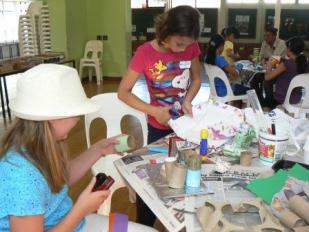 R30.00 per learner for Art workshops. Decide well in advance when a lesson in the Kirstenbosch National Botanical Garden is going to be most beneficial to your learners. Contact Jacqueline Loni, on 021 799 8670 to book your visit. To confirm this booking, the full amount should be deposited into the SANBI bank account seven days after we have received the booking confirmation (see booking form for account number). Cheques need to be made out to the South African National Biodiversity Institute. Please note that if you cancel your booking less than six weeks before your visit, you will pay a R300.00 cancellation fee. Should you cancel within four weeks of your booking or bring fewer learners than you booked for, you will be liable to pay the full amount. Please ensure that there is at least one educator or adult available to supervise every 20 – 25 learners. These accompanying educators and adults participate free of charge and are expected to be with the group for the duration of the lesson. Learners should bring their own lunch as there is no tuckshop to buy snacks or drinks. The education officer on duty will meet you outside the Gold Fields Environmental Education Centre. Do not go into the Garden unaccompanied. If it rains on the morning of your visit, the lesson will be adapted to accommodate the inclement weather. We are able to offer very good indoor alternatives for our lessons. The Gold Fields Centre at Kirstenbosch offers educational programmes for youth and adult groups from community and environmental organisations, universities, partner institutions, education departments, tour guides associations and general interest groups. The themes covered include global warming and its effects on biodiversity; sustainable use of plant resources; and the adaptations of plants in the Fynbos biome. The participants engage with information about biodiversity and environmental issues as well as ideas for innovative and hand-on activities that they could amend and use for their own work-related contexts. Special programmes are offered during the school holidays. These include fun learning experiences in the Garden for learners of all ages. Learners participating in these programmes include, but are not limited to school groups visiting Cape Town, various church youth groups, participants in the Department of Social Development’s programmes, etc. Nature’s Treasure Box, which is suitable for ages 6 – 9. Monday to Friday during the school holiday period. Contact Sally Hey, on 021 799 8676 to book your visit. Please note that pre-booking and payment for the holiday art workshops is essential. Please look at the Kirstenbosch events on the SANBI website, to get dates for these workshops. This topic is recommended for learners visiting the Garden for the first time. Learners are introduced to the main areas in the Garden by following a simple map. They explore the diversity of plants in the forest and fynbos sections and visit popular sites such as the Dell, Colonel Bird’s Bath, the Cycads, Pearsons Grave, Matthew’s Rockery and the Otter and Main Ponds. Senior Phase learners are introduced to the concept of the evolution of plants. Younger learners are encouraged to use their senses to explore the variety of plants and animals in the Garden. Plants and animals have interrelationships and interdependencies to survive in their environment. Our Grade 4 and Grade 8 lessons explore concepts such as food webs, photosynthesis, symbiosis, pollination and seed dispersal in the forested areas found at Kirstenbosch NBG. Learners also become aware of the effect people are having on our fragile ecosystems. A programme, for Grades 7 and 8, looks at the place of birds in the ecosystems of the South Western Cape. Plants are adapted to the environment in which they live. The external structure of a range of plants is investigated and linked to how it helps them survive environmental conditions. With the video microscope, everybody can see the adaptations of the plants, such as hairs and oil glands. People depend on plants in a variety of different ways. The uses of indigenous plants for many everyday products are investigated. The medicinal, ecological, aesthetic and economic importance of South African plants are discussed as well as issues around sustainable use of this valuable resource. A new Grade 6 Programme focuses on Indigenous Knowledge, with special reference to indigenous plants and animals. Fynbos, Forest and Succulent Karoo biomes, as found in Kirstenbosch NBG, are compared. Geographic and environmental conditions are discussed. Different types of plants and animals are found in different biomes. The value of each biome is discussed and learners consider the pressures and threats to each biome. Water is a precious resource. It needs to be better understood and managed to ensure sustainable supplies. Wetlands and streams in Kirstenbosch NBG are used to study the water cycle, water quality and diversity of life in water. Learners have a chance to find water organisms and identify them. They consider ways in which they can use water more wisely and go home with an idea they can implement in their school, community or home. Grades 2, 4 and 6 learners can particpate in these lessons. We are launching our Grade 10 Agricultural Science lesson in 2017. Topics include soil types, pollination, plant reproduction, as well as a practical propagation session. Grade 10 learners, who are studying tourism, will find our programme, which focuses on Kirstenbosch as a tourist destination, useful for their studies. In this programme, they interview clients to discover the profile of visitors to the Garden. They also examine the infrastructure which makes Kirstenbosch NBG a world class destination and do research into historical areas of the Garden. They conclude by developing a marketing tool for the Garden. The great variety and endemism of plants in the fynbos is unique. The concept of biodiversity is explored and learners visit the forest, fynbos and succulent areas of the Garden to see the variety for themselves. The Grade 5 – 6 lesson focuses on the diversity of life in the 3 biomes. We have a new Grade 7 CAPS-linked biodiversity lesson which covers the Biosphere, classification, monocot and dicot flowers and plant reproduction. Our CAPS curriculum-linked Grade 11 Biodiversity Programme compares Bryophytes, Pteridophytes, Gymnosperms and Angiosperms. It also considers how different plants came into being in response to changes in environmental conditions on Earth and how they are adapted to the conditions in which they live. The effects of Climate Change on biodiversity are considered in our Grade 5 – 7 Global Warming lesson. For Grade 11 FET learners, we offer a Life Orientation lesson on the theme of Global Warming. Learners are encouraged to consider their own environmental footprint and to take responsibility for making wise choices for the planet. This includes the conservation of our rich biodiversity. We also offer a Grade 5 – 6 art workshop lesson in which the learners consider the impact waste is having on biodiversity and then make a useful item out of waste. Special lessons are offered to schools and community groups during Environmental Calendar Days and Weeks throughout the year. Wetlands Week is held in February. Wetlands play a vital role in purifying our fresh water, and yet many of them are degraded or polluted in various ways or infested with alien vegetation. We raise awareness of these issues during this week. By celebrating National Water Week in March, we aim to give learners and educators some knowledge as well as skills about the importance of water conservation and the protection of water resources. This lesson, therefore, allows learners to actively engage with topics such as: How much fresh water if there on Earth for humans to use? Where does our water come from? How do rivers become polluted? What is a wetland and how does it function? What sorts of animals are found in a river? What is waterwise gardening? How can we save water and not waste it? What can I do to help? The term biodiversity refers to the huge variety of living organisms on Earth as well as the different ecosystems in which they live. Although a number of our lessons focus on biodiversity to a lesser or greater extent, Biodiversity Day is celebrated in May with a fun-filled lesson that focuses on exploring the rich biodiversity of the Kirstenbosch Garden. Learners build an understanding that living organisms are linked to each other and depend on each other in complex food chains and food webs which have to be conserved because they not only provide human beings with the resources that we require, they also maintain life on Earth. Learners create artistic ‘biodiversity’ crowns and write messages of commitment on a biodiversity banner which they take back to the rest of their school. We celebrate World Environment Week in June. The annual theme chosen by the United Nations is adopted and a lesson is developed around this theme. Once again, the lesson is learner-centred and addresses the issues of the annual theme through active learning. For the past few years, the lesson has been concluded with learners potting a number of indigenous plant cuttings; they are encouraged to monitor and record the growth of their plants back at school. We participate in the City of Cape Town’s Climate Change and Energy Week in August. Grade 5 – 7 learners are introduced to the concept and effects of climate change on the environment. They visit the forest and fynbos in Kirstenbosch Garden and learn, in a fun way, how plants have adapted to changing climates over time. We conclude by looking at the impact man is having on climate and they consider ways in which they could decrease the impact of their individual carbon footprint. We also offer our Grade 11 Life Orientation lesson during this week. In this programme, personal responses to the environmental crisis are encouraged. In September, Arbor Week is celebrated. Forest habitats are explored and the learners enjoy the hunt for specific organisms. They discuss the inter-relationships of organisms with one another. Food chains and webs are formed and then broken down as the impact of man is introduced. In collaboration with DAFF, trees are made available to participating schools and the learners plant tree seeds or seedlings which are taken back to school to be nurtured to adulthood. We also celebrate Heritage Week in September. 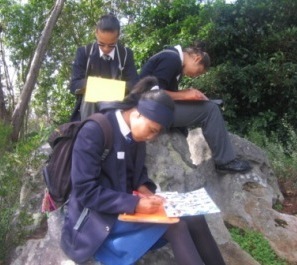 As part of a World Heritage Site, Kirstenbosch NBG is uniquely placed to offer programmes that encourage learners to appreciate the wealth of our natural heritage. We offer a Grade 2 lesson on Past and Present and an FET Tourism programme during this week. This year, our Grade 6 Indigenous Knowledge lesson will also be offered in this week. If you want to find out more about our lessons, please contact Sally Hey, the Kirstenbosch Principal Environmental Education Officer, on 021 799 8676.